Meditate upon the Scriptures, for within them you shall find eternal life. Our Lord, Jesus Christ my dear brethren, is the sweetest Master and Creator of all the Angels, and all the Noetic and sensible/perceptible beings which came forth from the depths of His mercy, immense goodness and boundless love, on which He has bestowed upon all of humanity, and in particular our faithful, and He continues to bestow this gift of life everyday with the rising dawn, and thus we glorify Him. For just as we read the Holy Efchelion (Unction) and were chrismated by it for our own beneficial help, and if or when the Lord shows mercy through the intercessions of Our Most Holy and Ever-Virgin Lady Theotokos together with all the Saints, we are forgiven our sins and are made worthy to become partakers in the Kingdom of Heaven, then we shall be glad and glorify the Holy Trinity. For my dear Christians, in days of old, humans were once pure beings that spoke directly with God. However, later on humanity fell into the quagmire of sin and continued to follow its course, hence invalidating their ability and self-worth to communicate with God. Nevertheless, within those times of the Scripture, there was a man who was called Moses. Who, from the time of being a small child, received two charisms (carismata – gifts/blessings) within his heart, which were love for God and love for his brethren. Consequently, we too as pious Christians must have these two loves, for was it not the Lord’s command that: “This is My command to you, for you shall love one another just as I have loved you”. Did you hear my dear brethren what Christ says? For did not Christ suffer curses, spitting, scourges, hunger, thirst and crucifixion, spilling His blood for your love, so He may free you from the hands of the devil. Thus you should love God and your brethren according to the same manner, even if circumstances bring about the need for you to spill your blood for their sake. For in the depths of the East (possibly Asia Minor or the Middle East) there was a Bishop whose estate was great, but had given command that auctioneers were to sell all that he had and to distribute the proceeds towards works of mercy. He then commanded them to take the hundred slaves that served the Bishop’s estate and bestowed them their freedom. Nevertheless the Bishop’s ministry of mercy did not cease there, for he had heard that within his jurisdiction there was a widow whose child was enslaved. What did this Bishop do? However I ask whether we can find such a person amongst ourselves who has this sort of love? Unfortunately, No! So do not sell yourself into slavery, at least sell what you have and give the proceeds to works of mercy. What, you are not able to do this? Then give half, or a third or at least a fourth of what you have. Are you unable to even give this? Then do not take the bread which belongs to your brethren, nor seek to persecute (katatrechein) others or slander and defame them (sukofantein). Thus, how do we wish to be saved my dear brethren? For one of these exhortations seems heavy to us, and another very bitter. Yet, it is true to say that God is merciful, but He is also fair and just, for He has a rod of iron to discipline us out of love. Therefore, if we want to be saved, we must have love for God and towards our brethren. Recall that Moses fasted for forty days and nights, and became like one of the angels. In like manner, we too fast on Wednesdays, since we remember our Messiah’s betrayal, and fast again on Fridays to mark Christ’s crucifixion. Furthermore Moses learnt letters (grammata – that is to read and write), thus so should we learn, so that we come to know the Law of God. And if the adult folk do not learn, then we are obligated to ensure that our children should have the opportunity to learn. Do you not see how our Nation/Race (Genos –An appellation which refers to Greeks and all Orthodox Christians) has become barbarous and uncivilised through illiteracy, and now resemble wild beasts? For this reason I advise you to build a school, so that you may come to know and meditate upon the Holy Gospel, as well as all the writings of human endeavour and knowledge. For behold the all-kind God whose good judgement decided to make Moses worthy to become a king-like figure of the Hebrews and leading them for some forty years, and not only that, but to make worthy as a prophet. Yet what does it mean to be a prophet? Basically, in its most simplest form, to know and see the things of the past as well as the future. (profhithin – Comes from pro-fhimhi which corresponds with the Semitic “Nabi”). Hence in like manner my dear brethren, whenever we do good works, the Lord will make us worthy, and so when we ask of Him with faith, He will bestow it upon us. And if we do evil, and have no love within ourselves, but possess hatred, then we have no part with God, but are joined to the devil in his eternally burning hell. For in times of old my dear brethren, the hater of good, that is the devil, brought out all of the evil that dwelt within himself in order to tempt humanity to pursue an alternate course alien to their being. Thus he encouraged humankind to give itself airs and become stubborn with pride, to murder and torture, to fornicate and whore itself, to commit adulteries, in full to do things that not even the most illogical of animals would do. Yet amongst humankind there were those willing to go even further and commit offence worse than those mentioned, for they began to worship the sun as a god, others chose the moon, while others chose the sea to worship. 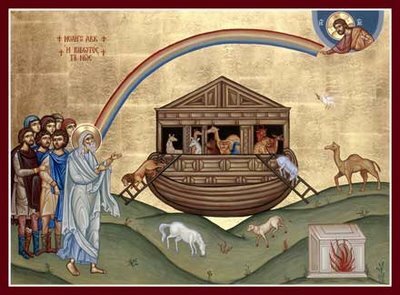 Consequently God expressed concern and expressed the desire to cause a great cataclysm that would destroy humankind, He thus forewarns Noah who was righteous in His eyes, to build an ark upon the earth. Noah responded to God’s call and began work on building the ark. When confronted by fellow countrymen, Noah responded by citing that God had intended to destroy humankind, while those who listened laughed and ridiculed him rather than enquire as why or how this could come to pass. Noah continued with work upon the ark’s construction. Yet people continued to ask him; “Why are you building an ark?” Noah would continue to respond; “Because God will destroy humankind”. Many exclaimed that he was mad. Yet again, one should ask as to what compelled God to destroy humankind? As for Noah, adhered to God’s command and it took him a 100 years to complete the ark. In those days only eight people were deemed to be righteous, that was Noah, his wife, his three sons and their wives. Wishing to protect all eight of them, God forewarns Noah to enter the ark to avoid the forthcoming rain, and to bring in all the animals of the earth, male and female, clean and unclean, into the safety of the ark. Meanwhile the people outside of the ark ate, drank and continued to engage in their diabolical (devil-inspired) works. It is then that God opened the floodgates of Heaven and the rain fell upon the earth like a raging river. “As indeed in the days of Noah, and in this manner will be the appearance (Second Coming) of the Son of Man”. To put it into more comprehensible terms, namely that in the days of Noah, people chose not to believe, and opted instead to ridicule such warnings until the “wrath” of God came suddenly upon them, and the cataclysm engulfed and drowned them. In like manner my dear Christians, the Second Coming of the Lord, will not be believed by people until then, when it comes upon them. Rest assured though, that what I am telling you, is not the fanciful whim of my own imagination or conviction, but they are the words of the Holy Spirit for those who are willing to believe and learn. Speaking personally, I had committed my own debt of transgression, for I befell for a gross deception my dear brethren, for when I was in my youth I use to say to myself: “Commit your sins now, for when I grow old I will do good and be saved”. However I have grown old and my sins have grown roots, and no matter what I do, I cannot do anything good now. Therefore be careful and remain vigilant so that you may not befall the same fate, but since you still have time on your side, make amends and do good works so that you may be saved. For three hundred years after our Saviour’s Resurrection, God sent St. Constantine and the establishment of a Christian kingdom (Byzantium) which endured for some 1,150 years. Afterwards, God brought the Turks out of obscurity, for our own spiritual benefit, and bestowed upon them a kingdom which thus far has endured for 320 years. The question may arise as why God brought the Turk and not some other nation? From what I can discern, it was primarily for what I said before, that it was for our own spiritual benefit, because in observing other nations there would have been concerted efforts to pervert our Faith and culture, whereas if you show submission to the Turks or try to placate them, you can do virtually whatever you want without hindrance. Nevertheless, the Lord wants to protect us from great calamities as well as the dangers of the Final Judgement, He bestowed one particular teaching essential for protecting and saving us. What is this teaching I am referring to? Simply that to do on to others what you would expect them to do to you, for if you do not wish evil upon yourself, then do not do evil upon others. Hence if you do not want things to be stolen from you, or to be slandered, defamed, cursed and so forth, then you should not steal, or commit murders and so forth to others. 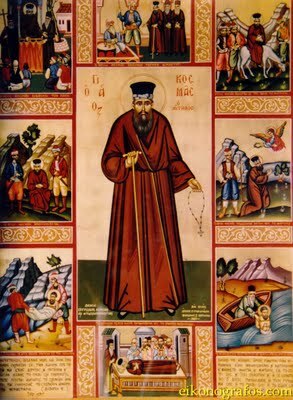 Now I shall advise you, both young and old, to take your worry-beads (komboloi) within your left hands and to do the sign of the Cross with your right hands and to recite: “Lord Jesus Christ, Son and Word of the living God, through the Theotokos and all the Saints, have mercy upon me Your sinful and unworthy servant”. For the all good and loving God bestowed upon us the Honourable Cross by which we can bless, as well as the All-Pure Mysteries (Sacraments). For with the Cross we open Paradise, for with the Cross we expel demons, but we must have our hands clean from sin, in that way the devil shall burn and take leave seeking refuge elsewhere. So my dearly beloved brethren, whether you are eating, drinking, or working, may this one teaching and the Cross never leave you. 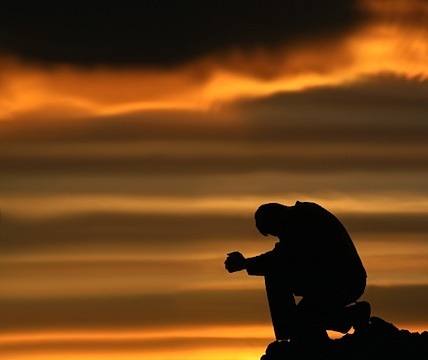 Furthermore, it is good and holy for one to pray always at dawn, in the evening and in the dead of night. Listen my dear brethren, for how should one do their cross, and what does it signify. Firstly, just as the Holy Trinity is glorified within Heaven by the Angels, you too shall clasp together the three key figures of your right hand, raising your hand with conviction towards Heaven, in worship, placing it upon your forehead (since the head represents Heaven) and say: “Just as the Angels glorify the Holy Trinity, for just as my three fingers are joined together but distinct, so too is the Holy Trinity Three Persons but One God”. Then lowering your hand towards your stomach, you then proclaim: “I venerate You, I worship You my Lord, for You condescended and became Incarnate within the womb of the Theotokos on account of our sins”. Then raising your hand and placing it upon your right shoulder, you then proclaim: “I beseech You my God, forgive me and place me on Your right-hand amongst all those who are just and righteous”. Then you cross-over and place your hand upon your left shoulder saying: “I beseech You my Lord do not place me on Your left-hand amongst all the transgressors”. After completing these gestures, bow down to the ground proclaiming: “I glorify You my God, I venerate You and I worship You, for You were placed within the tomb, just as I shall be entombed”. And when you arise from the ground, symbolising the action of the Resurrection, proclaim: “I glorify and venerate You my Lord, for You arose from the dead to bestow eternal life upon us”. This my dear brethren is what the meaning of the Cross is! Yet I will cite an example to you, that will illustrate the power of the Cross. Within Egypt there was an impious king who had a Jewish Vizier, who later became a Turk (Muslim). At that time within the city of Alexandria, there was a Patriarch by the name of Joacheim, who was known by many as a holy and wise man. Of course these particular gifts that the Patriarch had in abundance, became known to the king who also learnt that the Alexandrians, irrespective of religion, held the Patriarch in great love and esteem. The former Jew who observed carefully the king’s growing admiration for the Patriarch enquired: “You have an immense love and respect for this Patriarch”. The king responded by saying that: “The Patriarch is a good man”. The former Jew responded: “Sire, call upon this Patriarch to visit us here, so that together we may discern his valour in confessing his faith or whether he is unable to defend it”. The king requested the Patriarch to come to his palace, where the Patriarch received an audience before the king and his vizier. The vizier confronted the Patriarch: “I want, Patriarch, to discuss various topics pertaining to questions of faith, in accordance to your choosing”. Patriarch Joacheim proclaimed that he was ready to even spill his own blood, and so he began his debate with the vizier. No matter what topic that the two covered, the result was always a defeat for the Jewish apostate who could not overcome the points raised by the Patriarch. So the vizier employed a different tactic posing his question: “Why should we continue to debate? 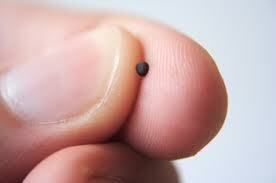 For I wish to learn something I have heard, that within your gospels, Christ asserts that if one has faith like a mustard seed, one can command a mountain to move from one place to another”. “Verily, this is true”, says the Patriarch. Then the vizier said: “In that case, if you are worthy, give command for this feat to occur, so that I might come to believe”. Then the Patriarch requested three days for deep prayer and meditation, after which he informed the king that he was ready to fulfill the vizier’s request. Thus the three of them and the king’s entourage journeyed three hours into the wilderness where there was a mountain. The vizier approached the Patriarch telling him to lift the mountain with his hands. Then the Patriarch grasps the mountain with one hand and holding a censer in the other, he began censing the mountain, then he did the sign of the cross three times invoking the name of our Lord Jesus Christ. He then said: “I command thee mountain, to lift yourself up and come into Egypt”. And behold the miracle, straightaway the mountain lifted itself up, breaking itself into three triangular pieces representing the Holy Trinity, moving from its former place and moved towards the king and the vizier, surrounding them. 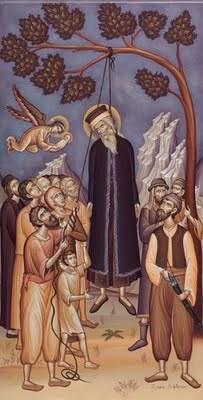 The king cried out: “Patriarch, help us for we are lost within this mountain”. The Patriarch made fervent supplications, by which the mountain transported itself one mile from the city they had departed from. Regretfully the vizier did not believe and wanted to subject the Patriarch to another ordeal, so he said to the king: “Christ had also said, that whoever has faith, even if they drank poison, they would not die”. Thus he leaned over to the Patriarch and said: “I will prepare a poison for you to drink, and if you do not die, then we shall come to belief”. The vizier then turned to the king and cited that: “The Christians have the Cross, and when they invoke it by gesture, it has the power to overcome all things, including turning bitter things into sweet”. The king thus commanded the Patriarch to drink the poison without doing the sign of the Cross in accordance to the vizier’s wishes. The Patriarch responded: “Alright sire, but you did not tell me how much you want me to drink. Nor did you tell me from what point of this cup you want me to drink from?” In asking this, the Patriarch had used his right hand to point to four differing points of the cup, thus invoking the Cross unnoticed. The vizier interrupted: “Drink as much as you like from whatever side you like”. So, the Patriarch drank the whole poison and remained unharmed in perfect health. He then turned to the king and said: “I have drunk all of the poison, but I ask that you command your vizier to wash this cup with some water and to then drink it. If nothing should happen to him, then we shall be obliged to follow him in his faith”. Naturally the Jewish apostate, who became a Turk for personal gain and not on account of faith, spurning family and brethren, naturally hesitated to follow through with the Patriarch’s request, but the king was in no mood for any back-downs, and ordered the vizier to drink. The vizier drank from the same cup and keeled over, choking to death. Therefore my brethren, did any of you understand the meaning of this? The magician responded: “Deny Christ and your Christian Faith and I shall be able to fulfill what you request”. Thus Julian exclaims: “I renounce Him”. Then the magician jotted some sort of writing upon a piece of paper and gave it to Julian commanding him: “Take this paper and go to a pagan temple, whereby you shall cast this paper high into the air, and spirits shall come. Whatever they do to you, do not be frightened or do the sign of the Cross, because if you do the sign of the Cross they will disappear”. Julian found a pagan temple and did what the magician had commanded him, but when the spirits came upon him, he became frightened and did the sign of the Cross whereby the demons dispersed. He returned to the magician, telling him of what happened, and so the magician commanded him to find a child and to kill it, and then to bring back the child’s heart back to him. Once again Julian sets off, found a child, killed it and removed their heart, bringing it back to the sorcerer. Taking the heart, the magician cried out aloud and demons descended upon them. Yet again, Julian became afraid and did the sign of the Cross, but to no avail because his hands were stained with the soul of the child, and thus the demons did not take fright but remained. Nonetheless, Julian did become king and reigned for two years before suffering a violent and tragic death, entering into the eternally burning flames of Hades. Therefore, we too must remain clean from sin, and only then does the devil flee from you. However my dear Christians, I wish to remain with you always, so that we can talk at length on any given matter, yet there are still thousands of places which have not heard the word of God for many years and await me eagerly. For these reasons I beseech the holy clergy present here, to provide for the spiritual needs of your flock, the laity, so that they and yourselves may be saved. In like manner, I also exhort the laity to honour your clergy, even if by chance you were forced to choose between honouring a king or a clergyman, honour the latter. Even if you were confronted by the presence of an angel and a clergyman, show due preference to the clergyman, because it is he who is higher than the angel. And if any clergyman wishes to know the reason for this command, then he should read the Law (Scriptures) so that he may understand his responsibility. Apart from this I do not have anything else of great import to say to you clergy present here, but to cite my own responsibility in answering to you when I kiss your hand and ask of you to entreat God to forgive my sins. This is because even all the faithful beseech and entreat God to bestow His grace and forgiveness upon them, the task remains incomplete since the Pure Mysteries (Sacraments) require a priest, who even if they are sinful transgressors, are able to petition and invoke the Holy Spirit to confirm the work of prayer. Nonetheless, I cite these things, for that whoever seeks to become a priest, must be as pure as the angels and to be literate so that he may read and explain the Holy Gospel. Yet this must occur at the request of the local bishop and the laity when the prospective candidate is over the age of 30 and without the exchange of money to bestow this blessing. Furthermore, that said priest should reside close to the church so that any laymen will know where to find him at any hour when there is need of his help or intervention. For one of the priest’s key tasks is to reconcile relations between a husband and wife, between siblings or between neighbours, bringing them back into the equilibrium of love, and sacrificing his all for the well-being of his flock. And when such a man who has become a priest, liturgises and completes the gospel pericope, he is obliged to explain the pericope’s tenets of what Christ seeks to teach the faithful to put into action. Furthermore, that he remembers that the tassels that hang from his stole (epitrachelion), represents the souls of the Christian faithful, and that if one soul is lost, he will have to give account to God on the Day of Judgement. He must also remember that the chasuble (phelonion) that he wears, which does not have sleeves, is to indicate that the priest must not have his hands mixed up in worldly things, but to always have his nous (mind, heart and spirit) focused on Heaven. For when he gathers his chasuble and folds it, if he is a man of good works, than they become a symbol of two wings like those of the angels by which he can ascend to Paradise. However if one is unworthy, illiterate, consumed by sin and gives money (grosia – piastres) and uses intercessors to become a priest, then he is buying himself a place in hell. For when he speaks of the Gospel, and lies profusely, then he corrupts himself and his own priesthood, all I can say is God help him! For back in times of old, when people wanted to tease or ridicule someone, they use to make an oath and said may God place you amongst the clergy of the 18th century! 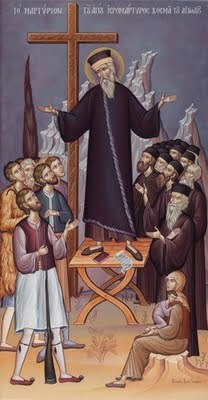 For these reasons my dear brethren, it is difficult today for patriarchs, hierarchs, priests and so forth to be saved. Therefore I advise you holy clergy, now that you have time, to repent and do good works so that you may be saved. As for those of you who are leaders or presidents of communities and villages, if you wish to be saved, then you must love all your fellow Christians just like your own children. Consequently you must not impose heavy burdens of debt upon your community members beyond their ability of strength. Rather, you must examine each case on a personal and individual basis exercising philanthropy. As for the rest of you who do not have responsibility of authority, I say to you to show respect to those who exercise authority upon your behalf. That the men should love their wives, even if she be evil and you are willing to remain patient with her, I assure you that your reward from God is great. In like manner, women love your husbands and consult with them in all matters, because with patience and due diligence in hearing, you will attain a good reward for your soul. Yet if any amongst you complain of a failing your husband may have, always bear in mind that he has more and greater responsibilities than you. Whatever the case may be, the two of you must love one another without question and show due care and respect to each other, for you are equals in the eyes of God! In having said this, we must note that children should respect and honour your parents, because those who do not honour or obey parents for their own good become accursed and in danger of hell-fire. However, if your parents forsake Christ, and agitate for you to do the same, should you also deny Christ? The truth is, do not listen or obey them then, for reward from God is great. Just as Abraham was sent by his father Terah (Qara) the idolator, to bring a sheep for sacrifice before the idols. As Abraham journeyed along the road to fulfill his father’s wishes, he began to meditate on the fact that this world, no matter where one stood, was always new and in a dynamic state of flux as if it had no authority. Yet my father ritually worships idols in a cold symbolic manner, and does not seek out and worship the true God who created Heaven and earth? From these inner meditations, Abraham’s voice was heard by Heaven which responded: “Truly your opinion is of sound thought, therefore go to the Promised Land and dwell there until I tell you what to do. For if you return to your father and tell him the things you have contemplated or have heard now, he will surely kill you, thus take leave of your father”. Hence, Abraham left and went on his way, by which God enriched him like a king, blessing his seed to become as numerous as the stars, and possessing 318 slaves who were his brethren and treated as such. As you can see my dear brethren, whoever has his mind and heart upon God, God will make worthy and ensure that in spite of tribulations will pass their journey of life well here on earth just as their entrance into Paradise will also be one of joy. And if your children should wish to become monastics, do not hinder them, but be joyful that they are following a good path. Yet if you see them journeying down an evil way, do everything possible to hinder them. Meanwhile, you should have devotion to all the Saints of the Church, particularly to our Lady Mary, because all the Saints are servants of Christ, while the Theotokos is the Queen of Heaven and earth, who often entreats Christ’s mercy upon our sins. It is for this reason that we must honour our Lady with fasting and works of mercy. 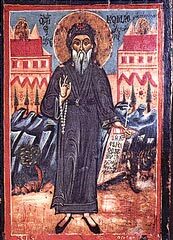 For there once was a man named John who became a prominent thief, who eventually became the leader of a 100 bandits, but he was also devoted to the Theotokos, reciting every morning and evening the Salutations of Panayia. The all-good God who sees all, wanted to save this devotee of the Theotokos by sending him a holy ascetic, whom his bandits saw and took hostage. 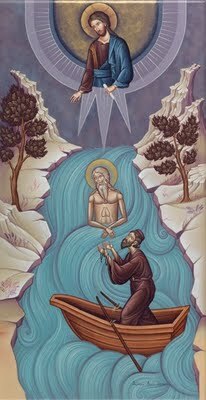 The ascetic said: “I entreat you to take me to your leader, for I have good tidings to bring him and for your benefit”. The bandits took the ascetic who then proclaimed: “Cry out aloud for me so that all the young lads may come and I could then tell you my message”. John bellowed aloud for all the bandits to gather together, who responded promptly. Then the ascetic asked: “Is there anyone else?” John cited that the cook was in the kitchen. The ascetic said: “Call him too”. The cook came, but he did not have the strength to look directly at the ascetic, turning his face away to look elsewhere. Then the ascetic said: “I command you in the name of the Holy Trinity to disappear and to leave in peace these Christians”. Thus the demon immediately disappeared and became like smoke. 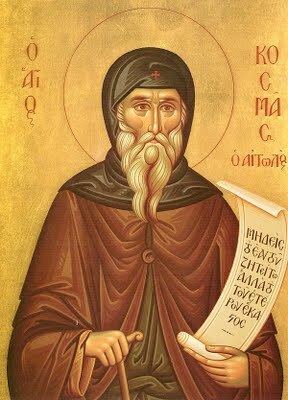 Then the ascetic proceeded to teach the thieves in truth, some chose to follow the monastic path, others chose to settle down and marry, while others chose to do works of mercy, and in this way they found salvation. For these reasons I advise all you men and women present here, to learn “Angelic leader”, to say within your prayers. 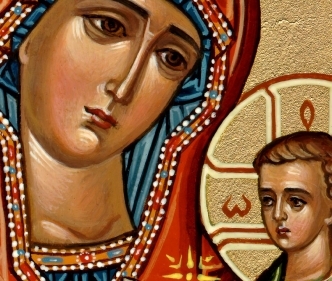 And if you want, also include “The salvation of Sinners” (Amartolon sothiria), to which 70 miracles of the Theotokos has been ascribed to it, of which I will relate one of these to you. There was once a daughter named Maria. Her father was a Christian who had sought to marry her off, much against her own wishes, for she wanted to remain a virgin. So the family thought it prudent for Maria to first experience monasticism before making any decision, and so she was placed in a convent under the care and direction of the abbess who raised Maria as her own daughter. In time her father passed away and a new authority came to rule over the land who journeyed to the convent where Maria dwelt in. Maria responded: “I do not know anything, for I only looked upon him with a different intention. For I said to myself; Look my dear God, will the glory that this pasha has in this world, will he also possess in the next? Yet while I was reflecting, this pasha looked at me as if he had some sort of evil intent. Nonetheless, if my own intention was to marry, then I would have fulfilled the wishes of my late father and wed a Christian”. The abbess wrote to the pasha: “It is better to send you my own severed head, than to send Maria”. The pasha would not abate and wrote back: “Either you send me Maria, or I will come to take her myself and set fire to the convent”. Having seen the letter Maria spoke with the abbess: “When those who are sent to do the pasha’s bidding, direct them to my cell and I will reply to their request”. The pasha’s messengers arrived some days afterwards and proceeded straight to Maria’s cell, and she asked what they sought. They said to her: “We were sent by the pasha to take you to him because you found favour in his eye”. Maria told them to await, while she went to the convent’s church, taking with her a knife and a plate. Going into the church and standing before the icon of Jesus Christ she said: “My Lord, you gave me these physical eyes through which to see the righteous path, and yet now I am compelled to follow the wrong path which is not proper. And since these physical eyes will cause me to remove my noetic ones, behold, for Your love I will escape this trap which leads to sin”. 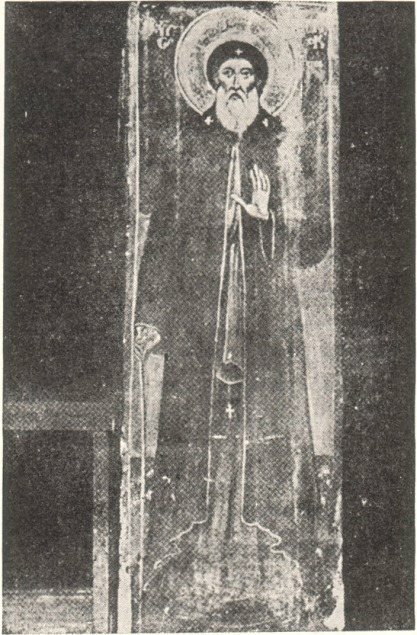 Maria took the knife and plucked out one eye and placed it on the plate, she then stood before the icon of Panayia and plucked out the other eye placing it also on the plate. She gave the plate to the pasha’s men to take back with them. When the pasha saw the plate, his satanic eros was converted and overcome with remorse and deep compunction. He got up and headed towards the convent, where he beseeched the sisters to offer up prayers to God, so that Maria may be healed and made whole again. Thus the sisters together with the pasha fell to the ground in fervent supplication to the Lord and the Theotokos to restore Maria’s sight. The Theotokos in response appeared like a great thunderbolt before Maria saying to her: “Hail Maria! Since you preferred to remove your eyes for the love of my Son as well as my own sake, behold for you have your eyes again, while the danger of this evil has been overcome and shall never harm you again”. 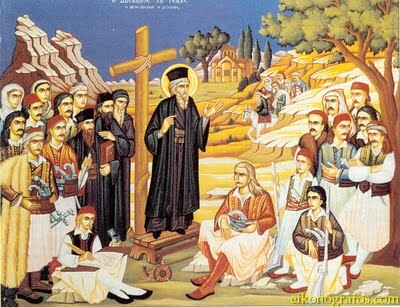 For the onlookers of this great miracle were silenced by awe and then glorified God and gave thanks to Panayia. The pasha as a sign of thanksgiving bestowed much gold upon the convent and sought forgiveness from the sisters, after which he returned home, and from that time onwards did many good works that paved the way for his salvation. Do you hear my brethren, what Maria did with the aid of Panayia? 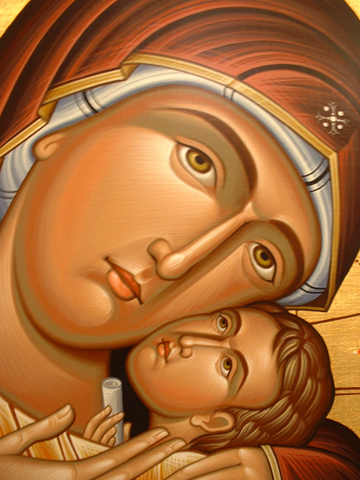 For we too need to honour the All-Holy Theotokos with good deeds. My dear brethren, our Lord Jesus Christ within good, teaches us in the Gospel this very epithet, that heaven help the one who scandalises his brother and does not ask for forgiveness before the setting of the sun, for they will come to know and experience Hades. Now it is possible that I who came here might have caused some of you to be scandalised? Therefore I will try to rephrase what I have said in a more conducive and surmised manner: Forgive me and God will forgive you. Now, if you want to attain the grace of Christ, the prayers of our All-Holy Theotokos and all the Saints, to embitter our enemy the devil, then whenever you gather together, as you are now, to say to each other three times: “Forgive me my brethren, and God will forgive you”. 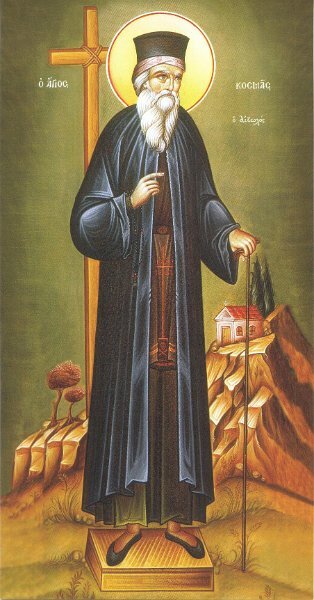 – May St Kosmas forgive my poor renderings of his words within translation, but may this be a step towards assisting other faithful to access his simple but sound words of wisdom. I also pray that I may have the joyful honour to design and build a church dedicated to his beloved memory, as befits his stature in this vast continent where he has no place to call his own shrine as of yet, Amen. This reflecting the Biblical notion of that when we are willing to take the first step, God is willing to make a hundred steps on our behalf. Note: After the flood God promised that He would never do such a thing again, the rainbow being the sign of this covenant. St Kosmas is making reference to the fact that in dealing with the Turks one may have to tread carefully, but if one secured connections with people of influence and clout, then most things are possible, which says something about Ottoman politics and administration of the time! The key foundations of which consist of the “meson” (inside link), baksheesh (the greasing of palms) and the roushpeti (dispensation and exchange of favours).